Trapezoid of layered glass with reflective white interior. Die cast base. Provides ambient, up, and down-light. Includes transformer to convert standard 120 volt line voltage to 12 volts. ADA compliant. 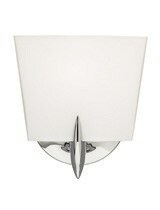 Lamping Low-voltage, 12 volt Halogen bi-pin lamp up to 50 watts, with Pyrex glass shield (included).